The free Shopify Buy Button plugin allows you to use WordPress as the content management system and Shopify for the online shop. It helps you to embed Shopify products on any WordPress site, using any theme, where customers can buy your Shopify products without having to leave the site. The shop and checkout will be handled by Shopify securely—no coding necessary, no SSL installation, no extra security setups, etc. You would setup the shop at Shopify, then embed the products on any WordPress site using the plugin. It connects to your Shopify shop which allows you to embed any product and collection created with Shopify. The products can be embedded anywhere on posts, pages, and even sidebar widgets. Customers will be able to buy your Shopify products on your WordPress site without having to redirect to Shopify. Because the shop and checkout is handled by Shopify, you don't need to worry about SSL setup and other security measures. With Themify Builder that is included in the free Simple theme, you get the flexibility of customizing your design and building beautiful shop pages with the drag & drop interface. Shopify is simple to use, trusted by hundreds of thousands of merchants, secure, and is backed by amazing customer support. Shopify handles all of the heavy lifting with ecommerce, which includes: order and fulfilment management, payment processing, and customer data security. 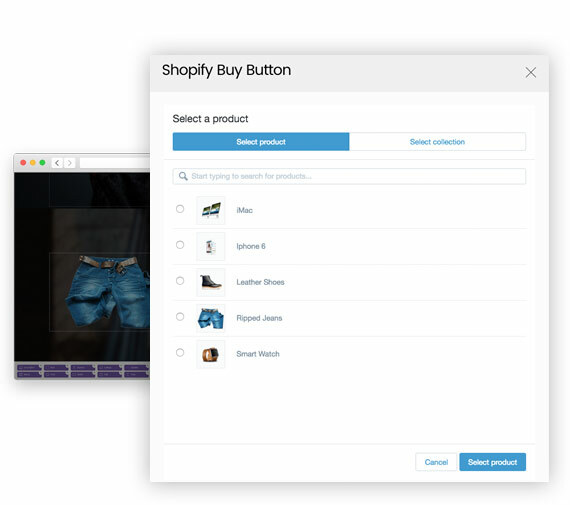 You can focus on providing a fantastic user experience and selling product, while Shopify handles the rest!